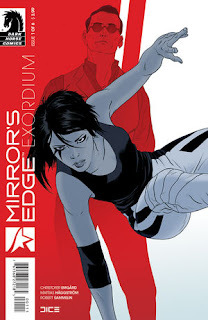 The Fellowship was fortunate enough to obtain a copy of MIRROR’S EDGE: EXORDIUM #1 from Dark Horse Comics. Christofer Emgard writes, Mattias Haggstrom and Robert Sammelin draw, and Davi Correia colors. In a corporatized city of glass-and-steel skyscrapers, Faith is a runner. Runners are outside, literally and figuratively. Her cabal is a good one, but there are lots of dangers on the outside. And she’s one of the best runners around, which is impressive since she’s not beatlinked. But a chance run-in with a crimelord gets her some info on her long-lost parents, and it’s clear that her life is about to change. Faith is clearly an orphan – outside the system, chip on her shoulder, the whole nine yards. She’s very talented, too, and it will be fun to see if that plays into the story. There are some interesting hints about her backstory here, and that’s nice to see in a videogame book (which often forget such things). The art is really well done, also, with really pretty city views and all of the posturing the characters are doing. If you’re looking for a book with a cool futuristic feel and a nice underdog story, this is a good one. And maybe we’ll get some surprises along the way. Check this one out. MIRROR’S EDGE: EXORDIUM #1 is available now at your FLCS or at darkhorse.com.